Making diagonally layered desserts is incredibly easy. First, you want to find a way to rest your glasses that’s secure. 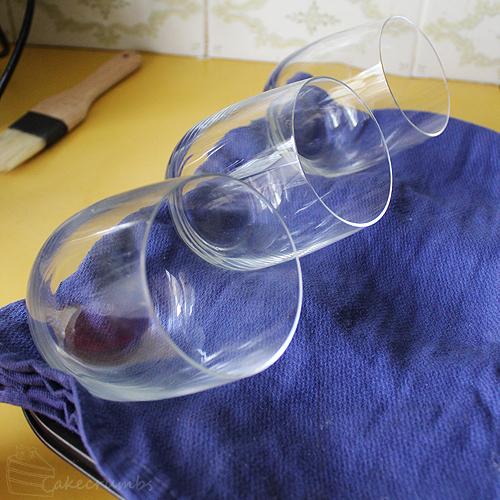 I use a texas-size cupcake tray lined with a tea towel to stop the glasses from shifting. Then I pop them in and give them a wriggle to make sure they’re not going anywhere. Try to get them on the same angle. 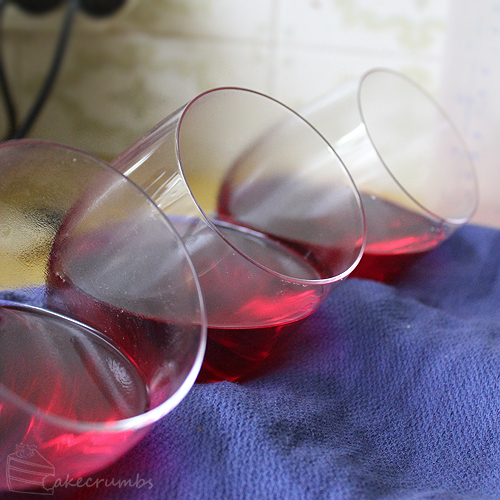 Then it’s a matter of pouring equal amounts of the first liquid, in this case the jelly, into each one. You can use a measuring jug if you’re not confident eye-balling it. Make sure you allow it to completely set before inverting it. Don’t get curious and check or it could collapse. You can, of course, order it whichever way you prefer. 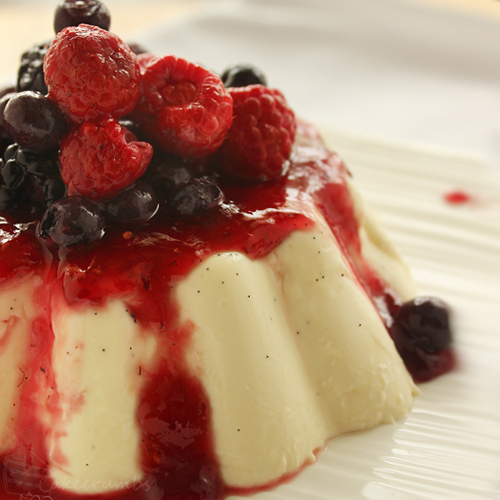 I like the contrast of the red, then the white of the panna cotta, then the red of the berries. Once that’s done, you can add the panna cotta. It is important to let the panna cotta cool completely before adding it to the jelly. That’s the lesson I learned on take two – the jelly began disappearing before my eyes! It’s wise to let it cool under any circumstance when using glasses as the sudden change in heat can cause the glass to crack. The first time I made the panna cotta, I used half cream, half milk. On this one I used all cream. Both are delicious, but the full cream one is noticeably richer and luxurious. Using vanilla bean paste, or a vanilla bean, gives it such a depth of flavour. It’s really quite a lovely dessert. 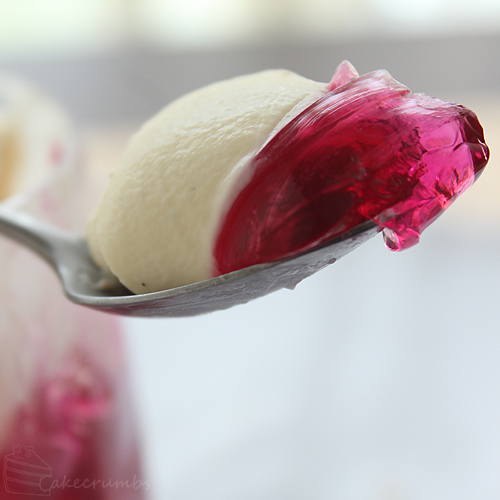 The jelly also makes for a lovely companion alongside the panna cotta. 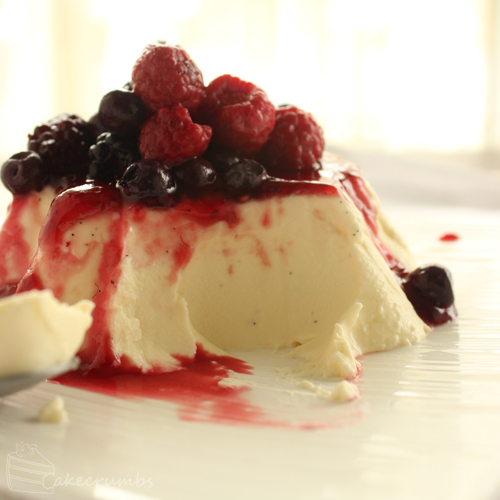 It gives a refreshing element next to the richness of all the panna cotta. 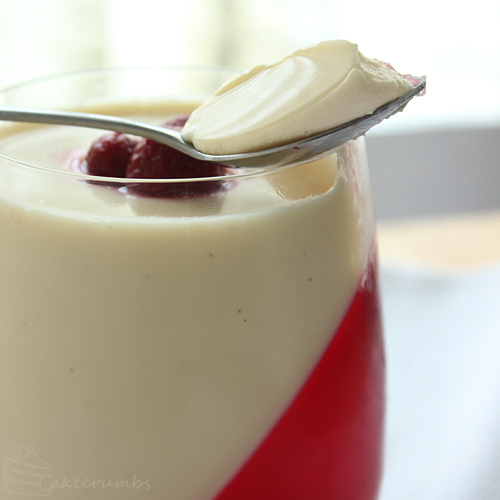 If you want to skip the jelly entirely you can just pour the panna cotta into a any dish, glass or ramekin alone. I made three tumblers full of the jelly version for us for dessert, then poured the rest into a scalloped ramekin of mine. It unmoulds pretty easily, though you still may want to oil your dish lightly to help it if you plan on turning it out. I served this one with a little jam and raspberry juice I heated together in a pot, then poured over the top and decorated with a pile of berries. I have to confess to loving this version a little more. The pronounced tartness of the jam sauce really cuts through the richness of the panna cotta and makes it the perfect partner. Whichever way you have it, it’s a quick and easy dessert that’s sure to satisfy. Make up the jelly according to packet instructions. Secure the serving glasses on an angle. 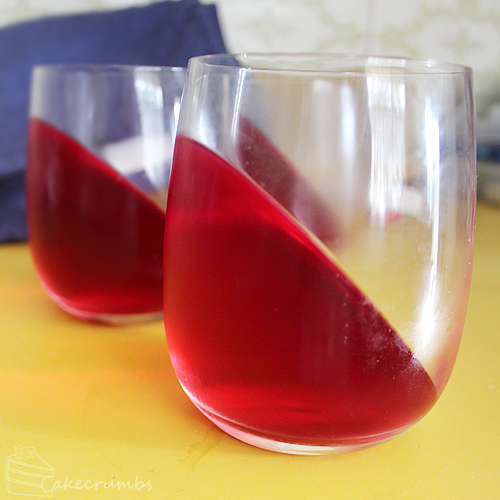 Pour equal amounts of jelly into each of the glasses, enough to fill about half the glass. Chill in the fridge until completely set. In a saucepan, heat the cream and sugar over low heat until sugar has dissolved. Add the vanilla bean paste and bring mixture to the boil. Remove from heat and pour into a large jug or bowl; allow mixture to rest for 10 minutes so the vanilla infuses. Meanwhile, pour the water into a small, heatproof jug or cup, then sprinkle the gelatine over it. Stand the jug in a small saucepan of simmering water and stir the gelatine mixture until it becomes clear and thin. Add the gelatine mixture to the cream and stir to incorporate. Stand the mixture either at room temperature or pop in the fridge until it cools to at least room temperature (but do not allow it to set). Remove glasses from the fridge and stand upright. Sieve the cream mixture to remove any skin that may have formed, then gently pour the cream mixture into the glasses over the jelly. Return to the fridge to set for 4 hours or overnight. When set, decorate with berries. 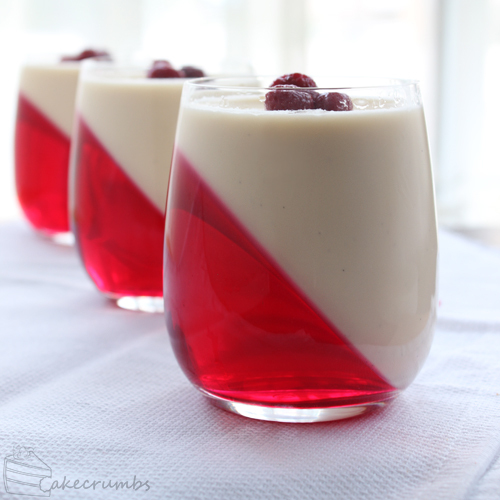 Amazing, layer panna cotta. I think I’ll try this! What a great idea! by raspberry jelly do you mean just a simple jell-o ? Yes, I believe that’s what America and co calls what we call jelly. And what we call jam you call jelly? When I refer to jelly, I’m talking about semi-set usually fruit-flavoured desserts you can buy instant packages of. Also caster sugar is called baker’s sugar in the US, and vanilla essence is vanilla extract and gelatine is gelatin. I want to try this recipe, but I was scared to see the ingredients until I looked them up! Correct on most accounts, however it’s worth mentioning that vanilla essence and vanilla extract are different things. Extract is, well, extracted from vanilla pods, is more concentrated and hence more expensive. Vanilla essence is an alcohol-free imitation version, it much less viscous, not as strong in flavour, and a lot cheaper than extract. It’s sometimes called ‘imitation vanilla extract’ instead. Saw this on dA, simply had to get the recipe to make for tonight. Absolutely marvelous, m’dear. I’m glad you enjoyed it! Thankfully it’s so quick to whip up another batch – I imagine that would have been nerve-racking for a moment! It really was the best panna cotta I’ve had. Perfect consistency and was hard to stop eating, even when I’d had too much! When you say cream, what kind? Like half & half, heavy cream? I usually don’t specify a type because most creams will work, and I like to leave it open to a person’s taste and budget. I usually use what we call thickened cream, which is 35% milk fat and usually some stabilisers in it. It’s cheap and I always have it on hand, so I usually default to this. But if you want a richer flavour, double cream or pure cream will also be fine. I’m thrilled to hear it went so well for you! Beautiful presentation. Can’t wait to give it a try! I finally lashed out and tried my hand at some sweet foods. Your recipe is so easy to follow that I think I impressed myself with the result. Thanks for these great ideas. I’m so glad it turned out well for you! Thanks! As a student I have a generally low budget and naturally don’t have too much time to cook. But this looks fantastic and easy, it’ll be nice to make a good dessert. Thank you for such a detailed recipe and a nice to read blog entry! My pleasure entirely! It’s definitely a quick dessert – I’ve often heard people say that if it takes more than 5 minutes to make you’re doing it wrong! Now I want to do this. I live in Panama, so I hope I can find the ingredients. Some ingredients are similar to the US. So I’ll let you know how it went. Lovely. I hope it goes well for you! Great idea on presentation! This is a favourite dessert of mine – delicious, quick and transportable. I also like making the white chocolate version. I’m going to make them with your tilted jelly idea for a picnic tomorrow. Thanks a lot! I have to admit to the white chocolate version being my favourite. I hope your picnic was wonderful! Say, how would one go about to try the panna cotta part of the recipe without gelatine? Here in Portugal we have seaweed-based-ready-to-make-jell-o but for the the panna cotta I would have to use agar-agar powder. Do you know how much should I use? Thanks in advance; your website is ruining my keyboard from all the drooling! You can substitute powered agar agar 1:1 with powdered gelatine. Agar agar does tend to set a bit harder than gelatine, though. It’s something I am still experimenting with. The good thing about agar agar is that it can be reheated and re-set, so you could try using half the amount. If you find it doesn’t set well, you can reheat it and add the other half. I’ve tried it once and it didn’t go so well. But that was potentially also because I used pure coconut milk which also sets on its own in the fridge so there are a few factors at play there. But yes, when I tried the agar agar it did have a more jelly like consistency. Kind of like those asian coconut jellies. I ended up reheating it and adding more almond milk and setting it again. It improved but was still not the creamy consistency I was after. Again, the coconut milk could have been at fault there so I have to experiment. I will comment back (or perhaps write a blog about it) if I have some success. Don’t know if you are still taking queries for this but firstly, great recipe! I tried this yday and what happened is the jelly shrunk a little when it set. As a result, the pannacotta mix seeped into the sides. What would have caused this? The jelly mix was hot when I kept it to chill. Is that why? Awesome, just found your blog and you remind me more and more of me in heaps of ways (and the partner only wanting custard too)! Will check more posts later when I have time – I’ve attached the link to my cakey stuff at Aureate Cakes. I’m only across the ditch too!